Together with the villagers of Davedi, we have created various 'community experiences' for our travellers. You can combine these activities and workshops with a stay in our Pineapple Village Lodge. Palm oil production in DavediA local guide will take you on a tour through the village. Prominent in Davedi is the oil palm tree and its multiple purposes. You will discover all aspects of the palm oil industry and learn about the importance of it to the community. 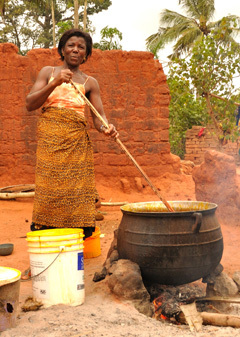 You will see women processing palm nuts into oil and learn some techniques yourself. You will visit Mr. Kadevi and his joyful workers. He is one of the great palm wine tapers in the area. You cannot leave his house without tapping palm wine or sipping gin. 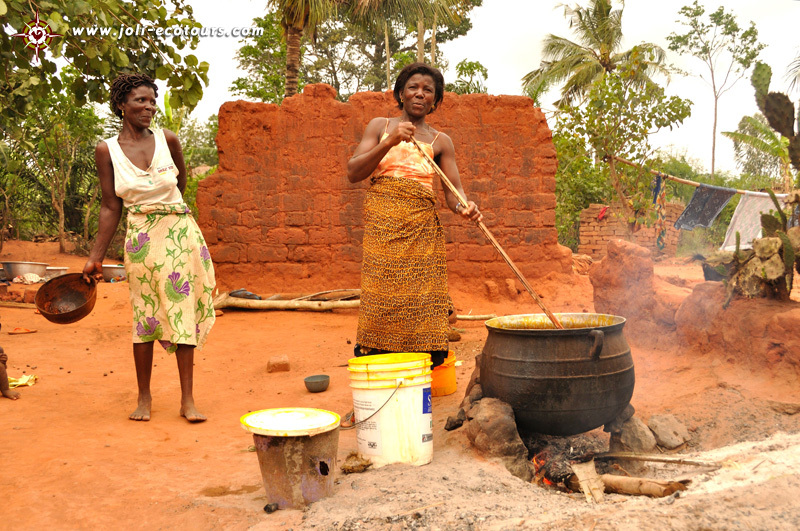 After the walk you will have a good understanding of local life and traditions in this rural Togolese village. The cost of the Basic Community Experience is CFA 1.500 per person (€ 2,50). Learn Blekete, a voodoo dance. Fetish priest will perform special rituals, so prepare yourself to go through it as you may be requested. Other dances are the Bobobor, an Ewe dance practiced by the youth, Gahu, a kind of Yoruba dance and other dances such as Bobo/Agbadja, Kine and Agbetikor. Another cultural workshop is the Ve game, a typical Ewe game. Performed in the afternoon. These workshops start from CFA 10.000 for 1-3 persons (€ 15,00). Cycle to Fomidja Kopfe, ten km distance away from Davedi. The route leads you through farm fields and forests. Worth attending is the voodoo dance. This tour costs CFA 3.000 per person (€ 5,00). Two elderly women who still hold on to the local traditions will show you their usual duty of catering for wooden twin dolls. They bath the dolls, dress them up and serve them with food and drinks. This is an opportunity to get the meaning of the twins culture. Starts from CFA 13.000 for 1-4 persons (€ 20,00). Some elderly and children will entertain you with amazing stories. Prepare to dance together with these traditional lecturers. Only in the evening. Costs are CFA 1.300 per person (€ 2,00).